Mar 27, 2007 in "Epcot International Flower and Garden Festival"
LAKE BUENA VISTA, Fla. -- A new Cinco de Mayo celebration, interactive bug releases, family-fun activities and how-to gardening sessions add plenty of themed fun to every weekend of the 14th annual Epcot International Flower & Garden Festival April 5 through June 3. Each of the nine festival weekends features a special theme with events and activities that add to the daily festivities. 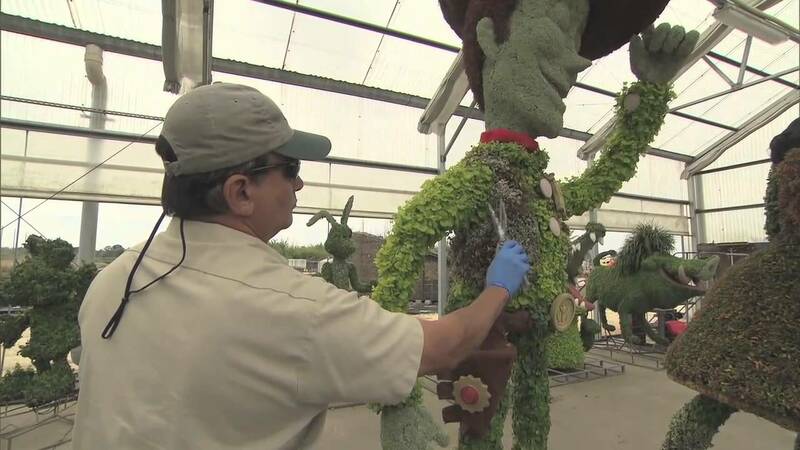 The festival opens with 30 million blooms, topiary magic, gardening activities and new exhibits. Paul Revere and the Raiders launch the Flower Power concert series at America Gardens Theatre. Paul James, a.k.a. "The Gardening Guy(" and host of HGTV's "Gardening By the Yard," answers gardening questions and provides helpful insight into this popular hobby as part of the Great American Gardeners series presented by the American Horticultural Society on April 5-8 at 12:30 and 3:30 p.m. at the Garden Odyssey Festival Center. Beloved Disney characters host a series of whimsical garden parties for guests. Tony Orlando in concert (4/13-14) and The Buckinghams (4/15) belt out nostalgic tunes during the Flower Power concert series. Pat Lanza, author of "Lasagna Gardening," dishes up tips on how to improve Florida soil for growing herbs and plants like the pros. At 12:30 and 3:30 p.m. at the Garden Odyssey Festival Center. Guests get a first-hand look at nature through the eyes of plein air artists and can browse the works of featured Art in the Garden artists. The Turtles featuring Flo and Eddie (4/20-21) and The Box Tops (4/22) rev up the Flower Power concert beat through the weekend. Renowned wilderness photographer Clyde Butcher talks with guests about their passion for the outdoors and offers photography tips. At 12:30 and 3:30 p.m. at the Garden Odyssey Festival Center. The renowned Florida Highwaymen appear with their legendary landscapes. Children can enjoy the Kids Paint Out experience in Future World East. Easels and special paint bottles are set out for kids to paint freehand (or any other style) with the assistance of a professional artist nearby. Disney's Animal Kingdom bug specialists appear to give guests a close-up look at caterpillars, spiders and other creatures. The Tokens (4/27-28) and Peter & Gordon (4/29) rock the Flower Power concert stage. Tom Turpin, award-winning Purdue University professor of entomology and founder of the "Bug Bowl," talks about the benefit of insects. At 12:30 and 3:30 p.m. at the Garden Odyssey Festival Center. Jiminy Cricket and friends make special appearances in Future World throughout the weekend at various times. The history behind the Cinco de Mayo holiday comes alive during fun-filled activities at the Mexico pavilion. Petula Clark revives 1960s memories (5/4-5) and Nelson featuring the songs of Ricky Nelson (5/6) strike a familiar chord during daily concerts. Central Florida gardening celebrity Tom MacCubbin piques interest with talks on edible landscapes. At 12:30 and 3:30 p.m. at the Garden Odyssey Festival Center. Moms are treated to a complimentary flower exclusively on Mother's Day, May 13. Families can celebrate mom at the Mother's Day Brunch on Sunday, May 13, at World ShowPlace. Times are 9 a.m. to 3 p.m. Guests can make reservations at 407/WDW-DINE (939-3463). Guerlain perfume specialist Raymond Western talks about the intimate relationship between perfumes and plants like those displayed at the France pavilion's Fragrance Garden. At 12:30 and 3:30 p.m. at the Garden Odyssey Festival Center. B.J. Thomas (5/18-19) and Grass Roots featuring Rob Grill (5/20) make Flower Power concerts sing each weekend day. Robert Bowden, director of the lush Harry P. Leu Gardens in Orlando, discusses plants with character, including those with unusual texture, color and habits. At 12:30 and 3:30 p.m. at the Garden Odyssey Festival Center. Tinker Bell's Fairy Garden showcases a glittering Tinker Bell topiary and provides fun for everyone, especially younger children. The new Pluto's Play Zone features climbing fun for kids 6 and up. On May 19, from 1-5 p.m., and May 20 from 9:30 a.m.-4 p.m., artisans showcase handcrafted dolls and teddy bears at World ShowPlace. Children can take part in Field Day activities in Future World East with beanbag tosses, relay races and other outdoor fun. Fans dig The SOS Band (5/26) and Gary Puckett (5/27-28) in concert for Flower Power fun. Gary Alan, landscape designer and TV and radio personality, talks about ideas and methods to create a magical landscape. At 12:30 and 3:30 p.m. May 25-27 at the Garden Odyssey Festival Center. Georgia Tasker, author of "Wild Things-the Return of Native Plants" and "Florida Gardeners Guide," caps the Great American Gardeners series with sage gardening advice. Tasker holds the Lifetime Achievement Award from the Tropical Audubon Society and writes for the Miami Herald.